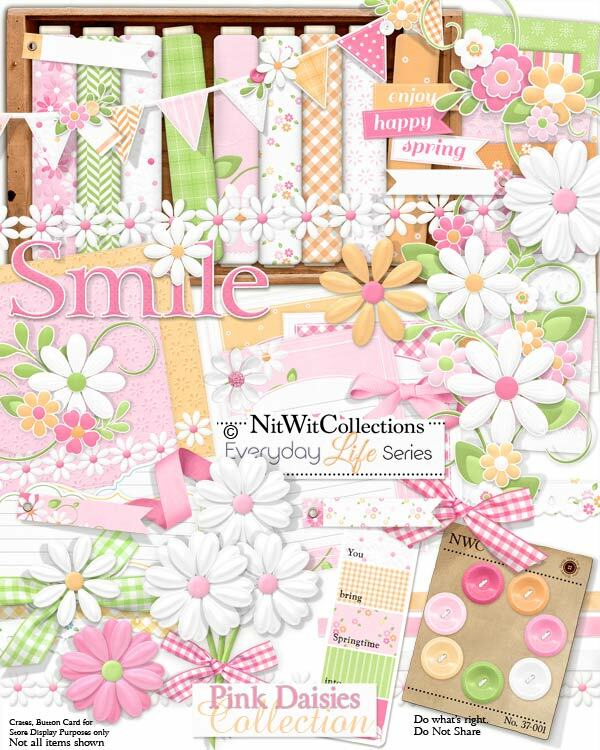 Everyday Life Series "Pink Daisies" Collection is a sister kit to our ELS - Daisy Collection as we had so many requests to have this same kit made into the colours that you see in ELS - Pink Daisies. We aim to please at Nitwit Collections™! The colours of this kit make you smile and feel that lightness in your heart! Pink, peach and green radiate happiness so creating a scrapbook layout or card with this in mind shouldn' t be too difficult to make. Just let your mind wander to that happy place, memory or feeling and let your mouse do the work!!! We hope that you can feel the joy and pass a little along to someone else with your layouts and cards.....we all deserve a little light heartedness!! 1 Peach daisy....we are quite the hybrid breeders, no?? 3 Journal mats - in light pink, peach and pink....which colour is your favourite to use? ?